B. Metcalf Paving provides asphalt solutions to residential and commercial customers in Connecticut, Maine, and New York. One product they produce is U.S. Cold Patch® which is an asphalt repair material that corrects potholes and cracks on roads, bridges, parking lots, driveways and other asphalt surfaces. 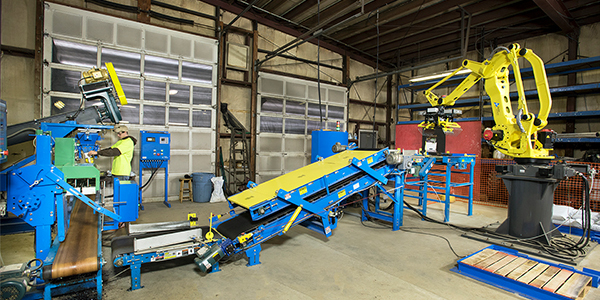 Magnum Systems has recently installed a new automated bagging and packaging system at B Metcalf's facility. The packaging system comes complete with; Incline Screw Conveyor, Gross Weigh Auger Scale, Hot Sealer, Knockdown Kicker, Bag Flattener, Pacing/Picking Conveyors, TRP3000 Robotic Palletizer, and integrated controls package. We asked Ben about his experience working with us and his satisfaction level with the installation and operation of the system. He had this to say… “When one of my largest customers asked me if I was interested in bagging the material we previously manufactured, I jumped at the chance. Researching other plants I found that most of the operations I wanted to emulate were operating systems from Magnum. I found there sales staff to be very knowledgeable and helpful. Any equipment needs to be tweaked and adapted when it comes time to install. Those changes were dealt with promptly and fairly. When this system is operating at its capacity I plan on working with Magnum again to install a duplicate system."